- Organization chart nodes with multiple parents (more than one parent nodes). To set the left sibling of the parent too as a parent of a particular node, attach a '^' character to the left of the node text. Similarly to set the right sibling too as a parent of a particular node, attach a '^' character to the right of the node text. It is that simple like all other configuration of the Chart4.NET organization chart component. 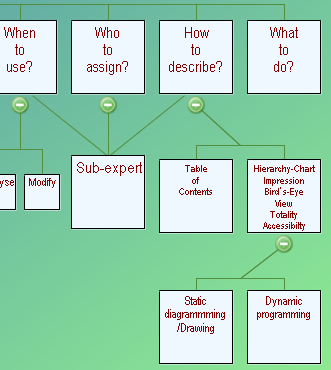 For example, in the following organization chart, the node text "^Sub-expert^", attaches left and right sibling of "Who to assign?" node as its parents, in addition to the direct parent. The attached characters will not be shown in the chart.